material objects orbiting the Sun. connect these for "line of nodes". basic definition of an ellipse. two fixed points (f1 and f2) is always the same value. 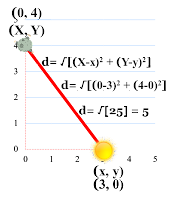 Distance to one fixed point can be computed via Pythagorean method if we plot points via Cartesian Coordinate system.Let an asteroid represent an arbitrary point (0,4), and let the Sun (aka "Sol) represent a fixed point (3, 0). 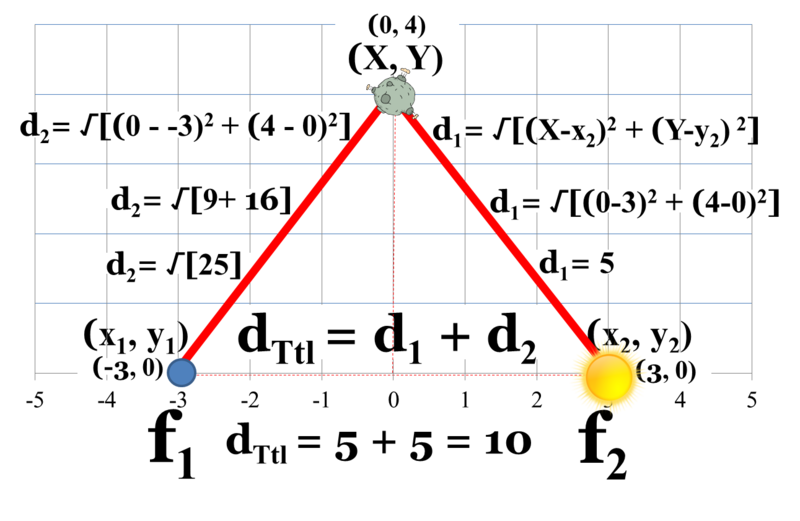 Distance to second fixed point (d2) can be computed with same, Pythagorean method as for first distance (d1) . Let the second fixed point be represented by a notional object, "Not Sol", arbitrarily placed at coordinates (-3, 0). As object orbits, distance to center varies. Minimum distance to center is "b", semi-minor axis. Maximum distance from the center is "a", semi-major axis. Fixed points, focus-1 (f1) and focus-2 (f2) anchor ellipse. In the Solar System, Sol occupies one of the focus positions. Objects which orbit Sol are "anchored" by Sol's massive gravity. "c" is distance from center to either focus. It can be determined from observed values of "a" and "b". Eccentricity is a measure of an ellipse's "flatness" or departure from a circle's symmetry. 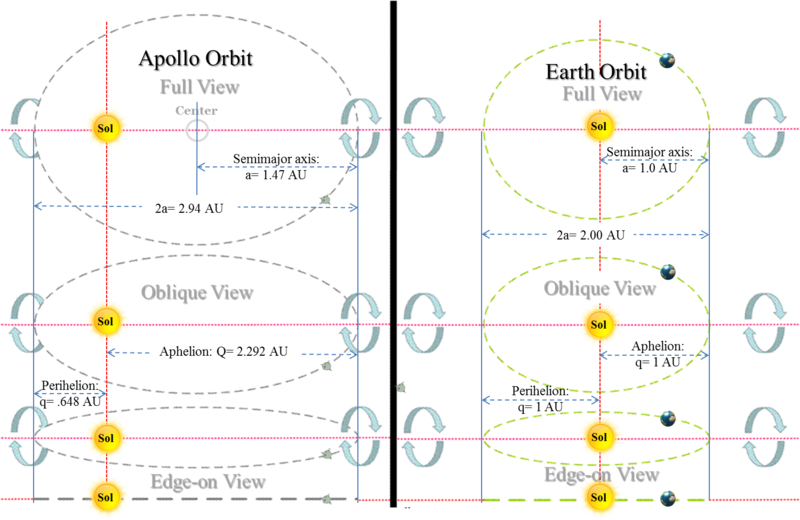 Positions of orbit centers and non-Solar foci can vary considerably. However, Sol contains sole point which is a focus of every Solar orbit. they'll always share Sol as a common focus. 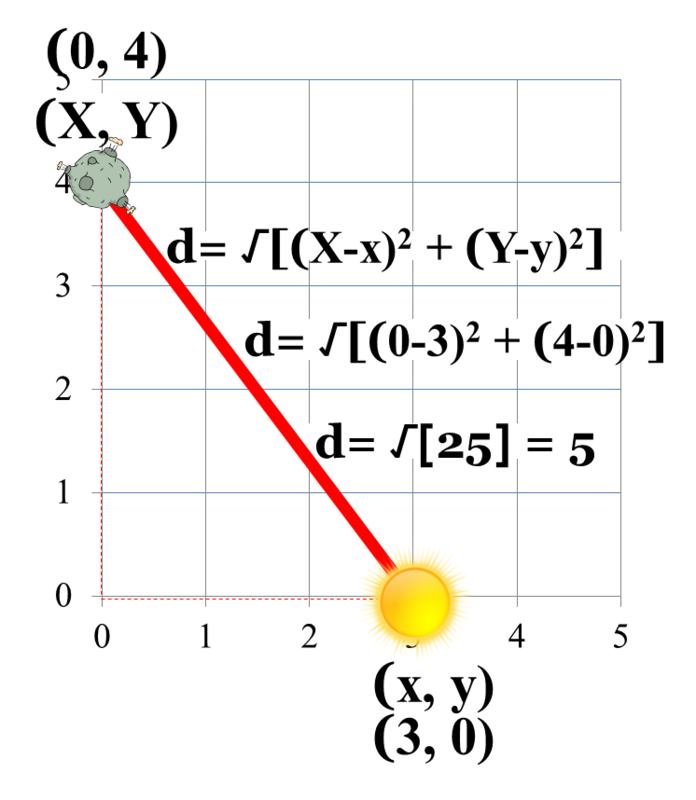 Q (=a+c) is distance to aphelion, orbit's farthest point from Sol. 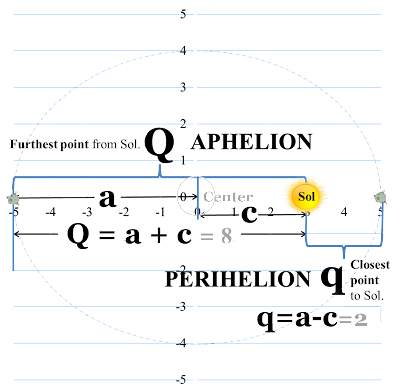 q (=a-c) is distance to perihelion, orbit's closest point to Sol. Named after the Greek god, 1862 Apollo was initially discovered by Karl Reinmuth in 1932. As the first discovered of the Apollo asteroids, the group has taken its name. Ironically, 1862 got lost and rediscovered in 1973; thus, its asteroid number (1862) is higher than some other Apollo asteroids (i.e., 1566 Icarus). It was the first asteroid recognized to cross Earth's orbit. It also crosses orbits of Venus and Mars (see online diagram). 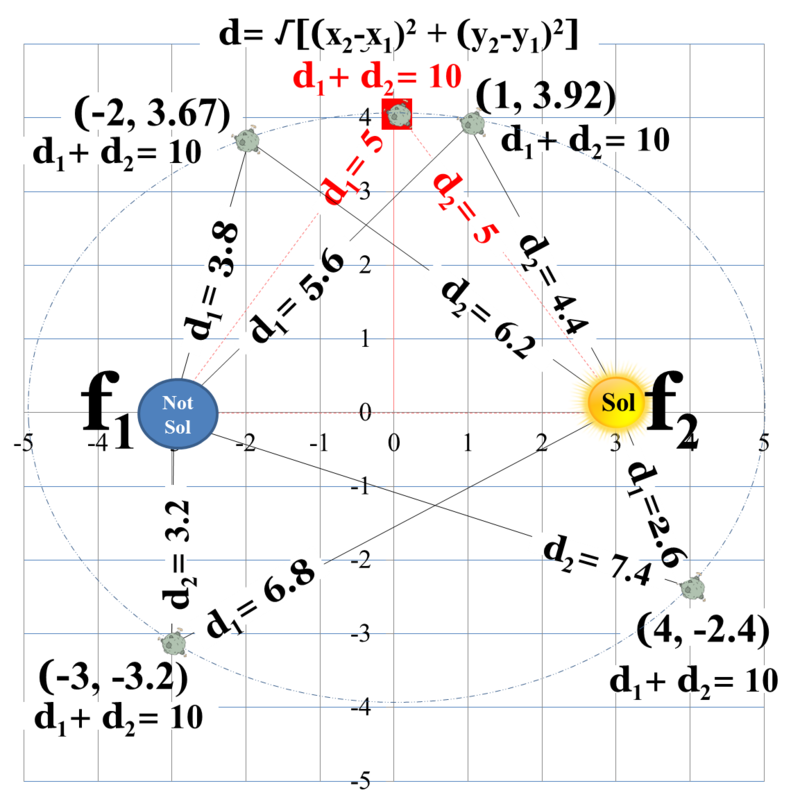 From values in above table, compute and draw some basic orbital views. 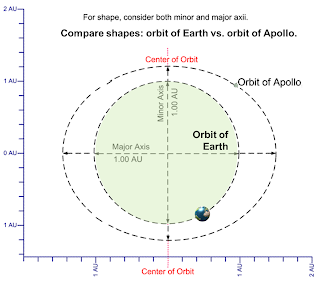 SEMI-MAJOR AXIS (a): Compare Earth's with Apollo's. 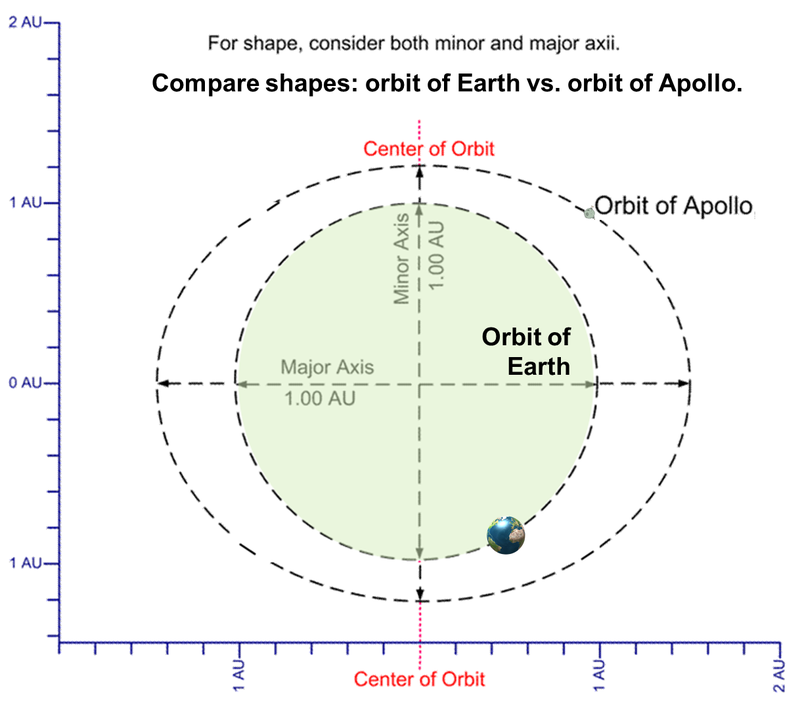 For ease of comparison, TE temporarily assumes a common center for the orbits of Earth and Apollo as shown above. In actual fact, Apollo is distinguished as first asteroid discovered to periodically cross orbit of Earth. Thus, orbit of Earth can NOT be completely contained inside Apollo's orbit. Kepler's first Law puts our sun, Sol, at a focus of all Solar orbits. For Apollo's elliptical orbit, each focus is .822 AU from center. We've arbitrarily chosen the left focus to show Sun's position. All Solar orbits share Sol as a common focus. 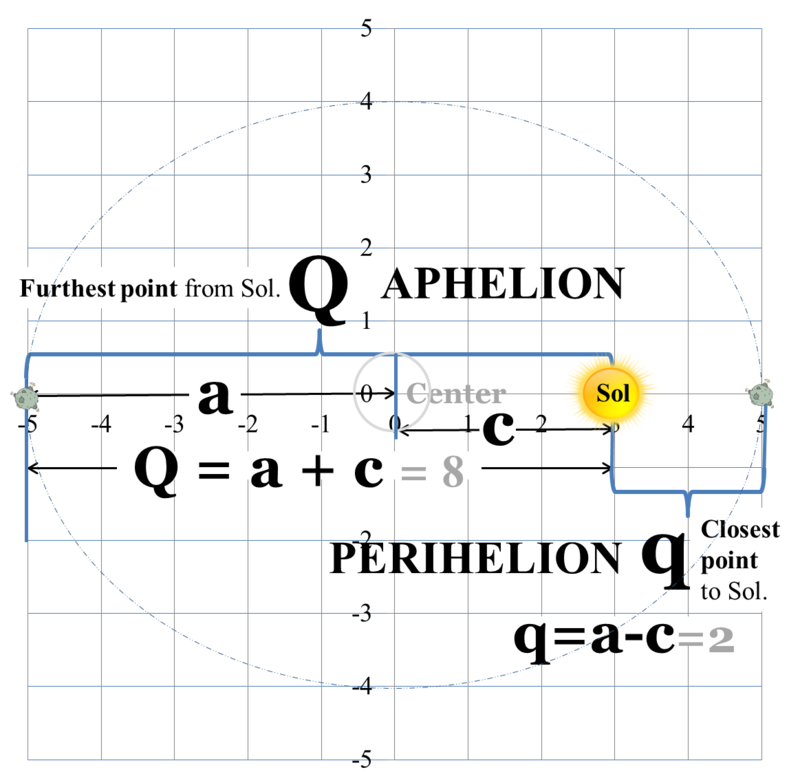 Since Earth's orbit is nearly circular, both foci lie within Sol at the center. the two orbits intersect as shown below. 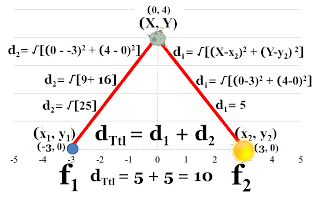 Given a and c, compute distances to perihelion and aphelion. 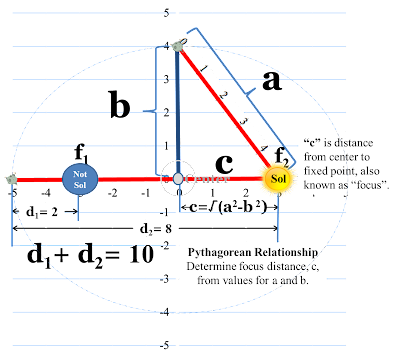 To best observe the angle of inclination, we must rotate a full face on view of each orbit until we achieve the edge on views. Still observing edge on view, join orbits at Sun to show angle of inclination. Earth's orbit is often used a reference for other Solar orbits; thus, it's often called the "Ecliptic". 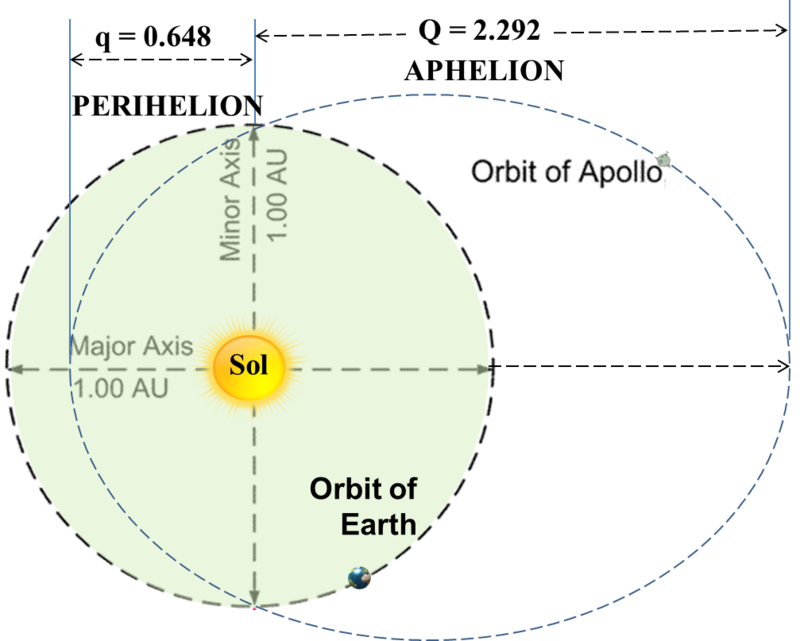 The orbits of Earth and Apollo share a common focus (occupied by the Sun), where the two orbital planes intersect at the "angle of inclination". 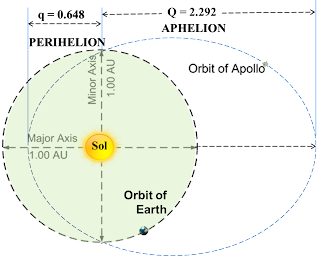 intersection between Apollo's orbit and the plane of the ecliptic (mean plane of Earth's orbit around the Sun). Ascending Node: point in orbit where the orbiting body crosses the reference plane going "upward". 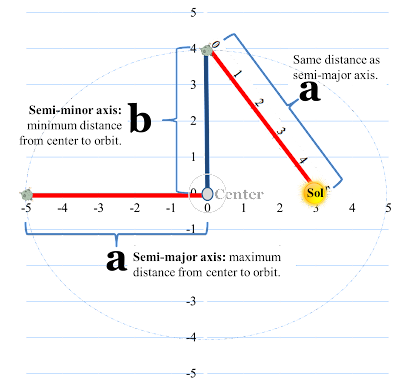 Descending Node: point in an orbit where the orbiting body crosses a reference plane, such as the ecliptic or the celestial equator, going from above the ecliptic (north) to below it (south). Objects of opportunity must intersect Ecliptic near "nodes".